Why did we choose to live debt free over making more money? For some, this seems like the stupid mistake, but listen to this podcast and find out why. More, more, more. Buy, buy, buy! It’s the American dream, right? It’s in all the pictures we see on Instagram, Facebook and Tumbler. Everyone wants that social medial picture-perfect life. The one that seems to breed envy. The one that makes the rest of us TGIF once a week for 50 weeks a year, while saying, “Ugh! I can’t take another Monday” 50 weeks more. To be honest, it was partly seeing and hearing our FB friends complain about the jobs they hate but felt chained to, each Monday morning that kept us motivated to follow through with our goal. You see, we were both headed up the pay scale and up the corporate ranks when we had our fateful visit to Winter Park, Colorado. The car ride that locked us in the car for 90 minutes and forced us to have a heart-to-heart about our finances. This is the one that convinced us that living debt free was a better choice than just making more money. Like usual, John and I are going against the grain when it comes to most in the cis white gay community. We aren’t running after the A-list, trying to hit all the gala events and show off our cars, homes or vacations, although we do love to travel. Instead, we chose living debt free first because it’s in line with our true values; our love for each other, our desire to spend more time together, having time to travel and see the world together and ultimately create a path through the dense jungle of financial confusion for our LGBTQ brothers and sisters who really want to help themselves. 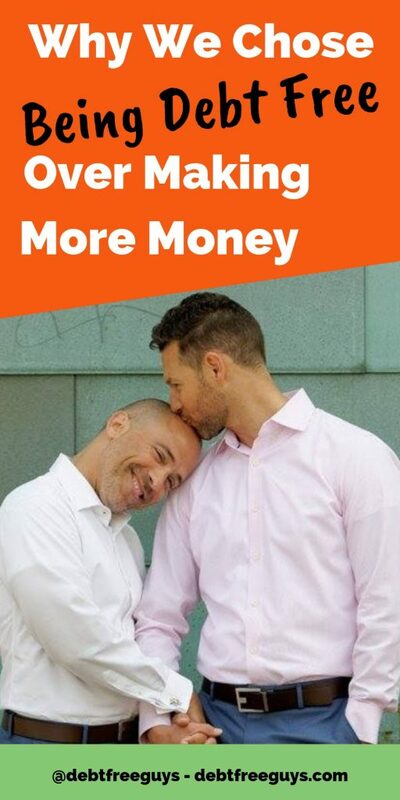 It may not be the choice for you, but if it is, we’ve got you covered on Queer Money™. Save this podcast for later. Click on the image to save it to your favorite Pinterest board.